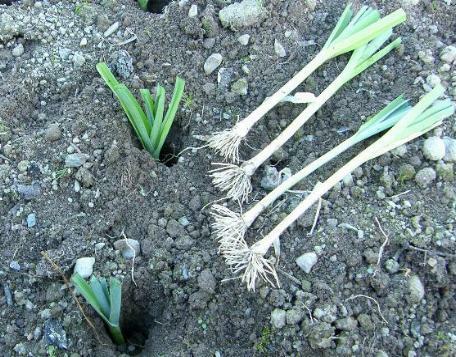 Leeks are a winter crop so can be grown where another has been harvested earlier such as the early peas and beans. Sow thinly in rows in March or April in another area, and when they are about pencil-thick transfer to rows about 25cm apart. Trim back the foliage to about 15 cm and and the roots to about 3cm. Place in holes made with a dibber, 15 cm apart with the tops just peeping out, water around them washing down some soil, they will grow into the space. Thrips can attack as with onions, making small specks of damage on the leaves. Leek Rust is the main disease; keep the crop free from weeds and well spaced. If any plants become infected they should be removed and destroyed. Spray with Dithane to prevent an attack. The surface of the plant tends to repel the spray so any application should contain a spreading agent such as soft soap to improve adhesion.